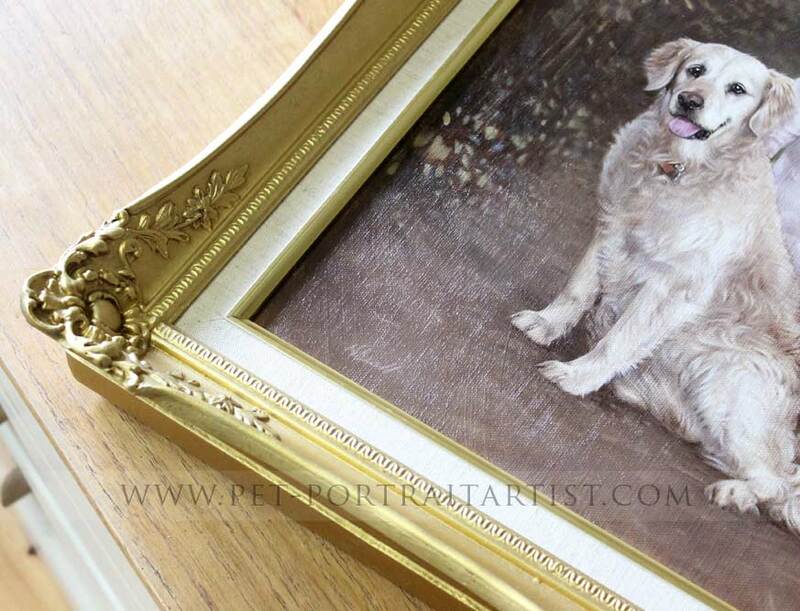 Welcome to our Knightsbridge Gold Pet Portraits Framing page. 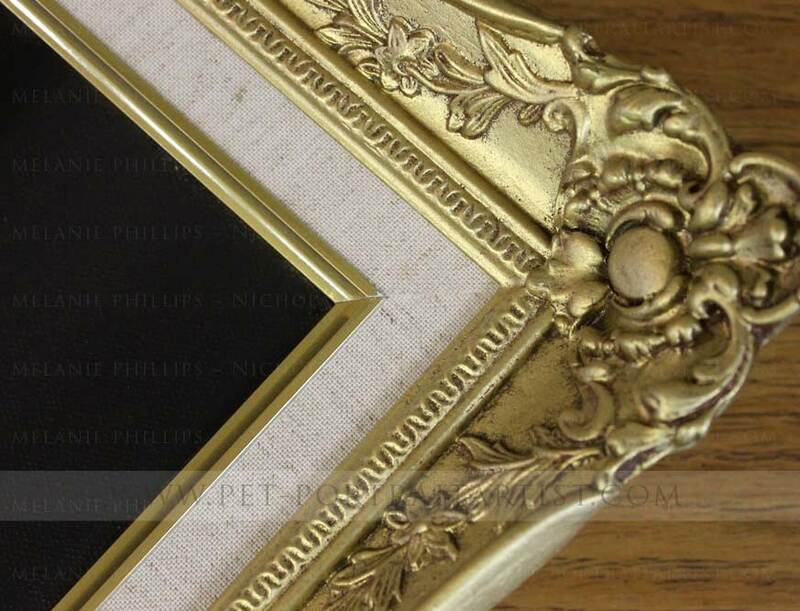 Our Knightsbridge Gold frame is beautifully ornate and extremely dynamic. 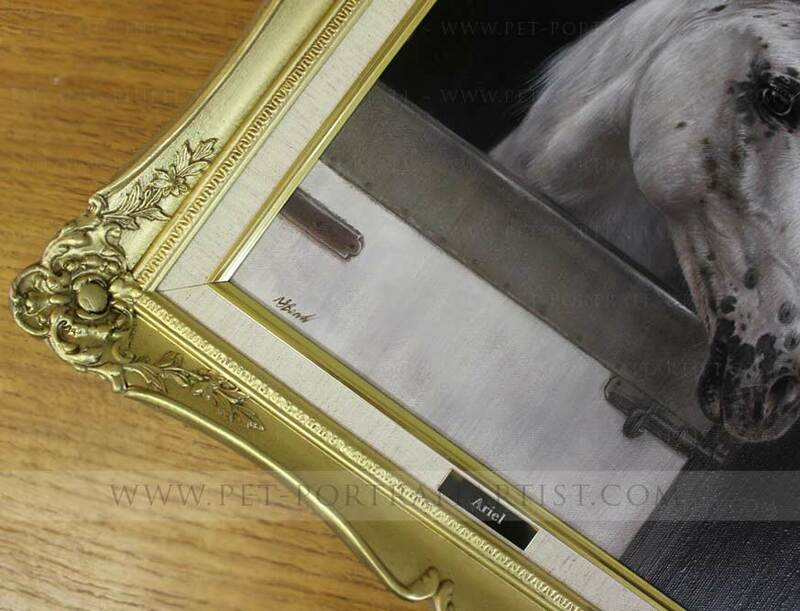 It works stunningly with all of our oil pet portraits. 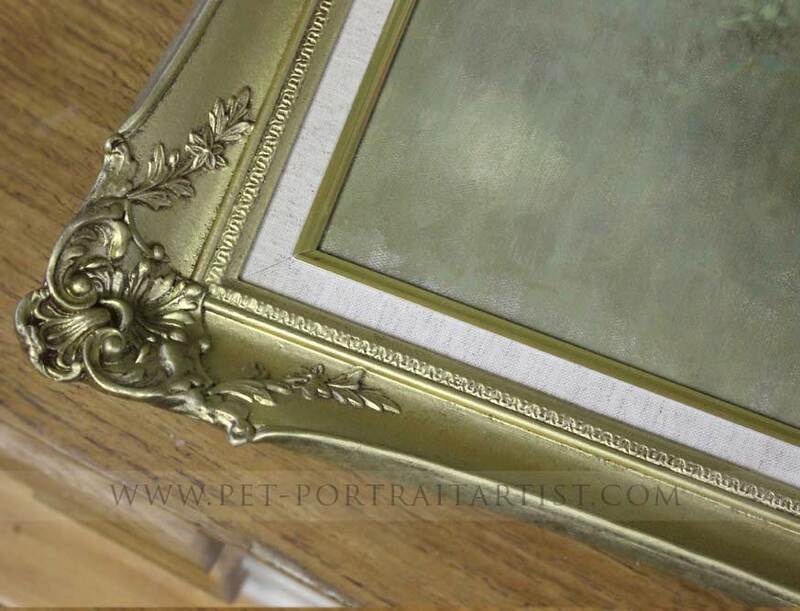 We commission a professional company in the UK to make our handmade swept frames, bespoke to our clients requirements. 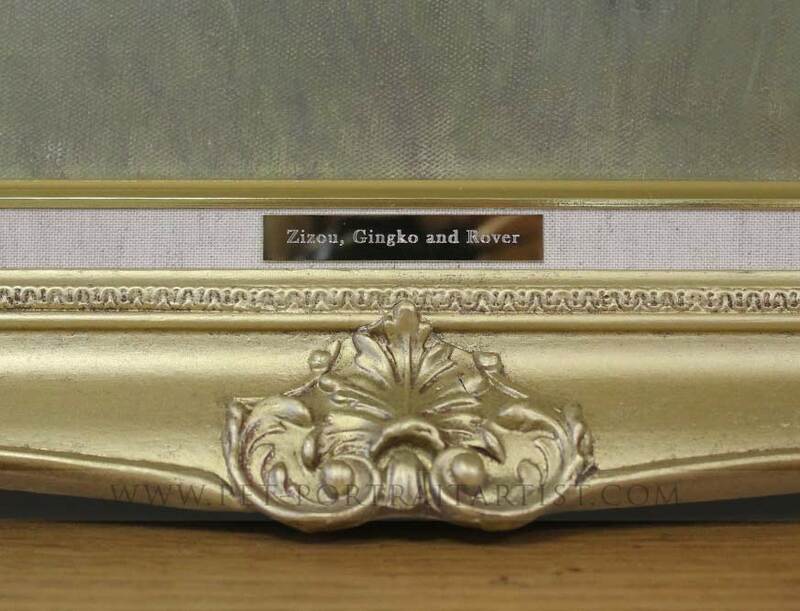 Our swept frames are suited to having an engraved plaque as it can be placed on the hessian slip area as you can see from some of the photos on this page. 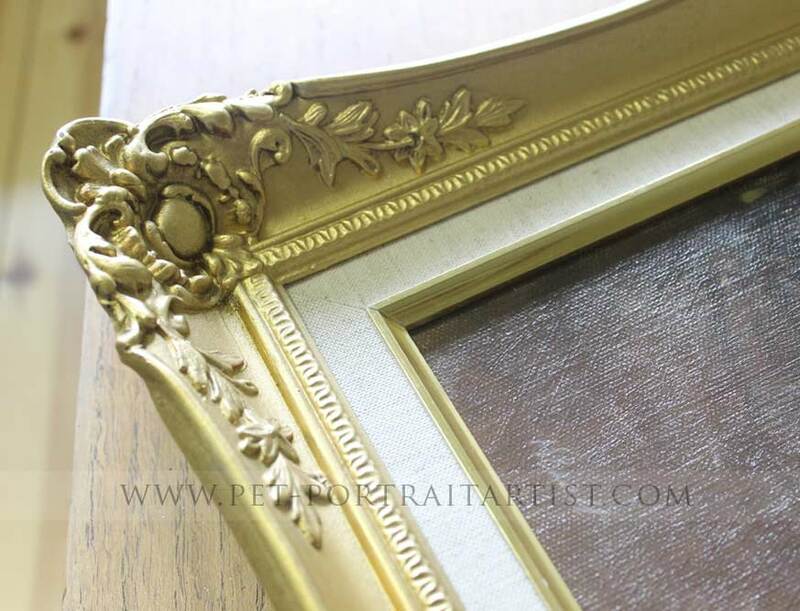 All frames are built up to cover the entire depth of the canvas so that when the painting is displayed on your wall, when looking from the side you only see frame and not the canvas behind. 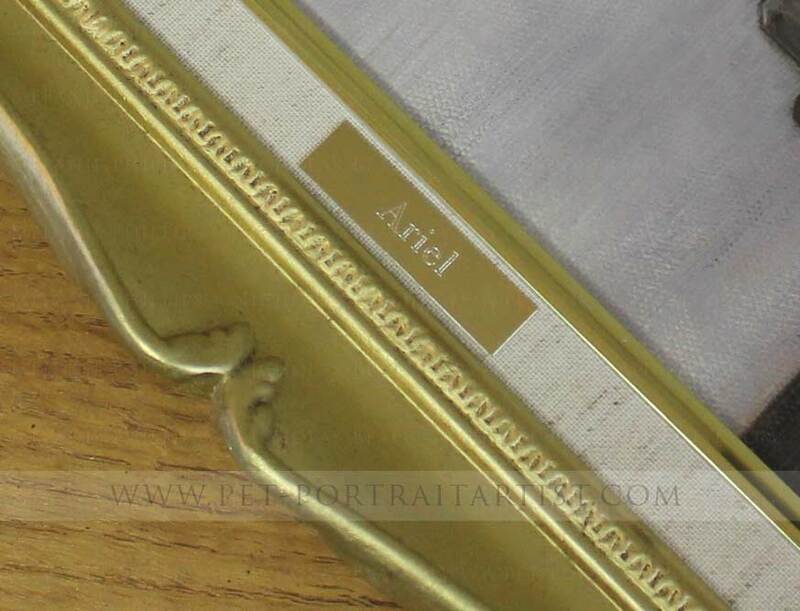 The frames on this webpage are all in a beautiful gold, however you can opt for silver if you prefer. 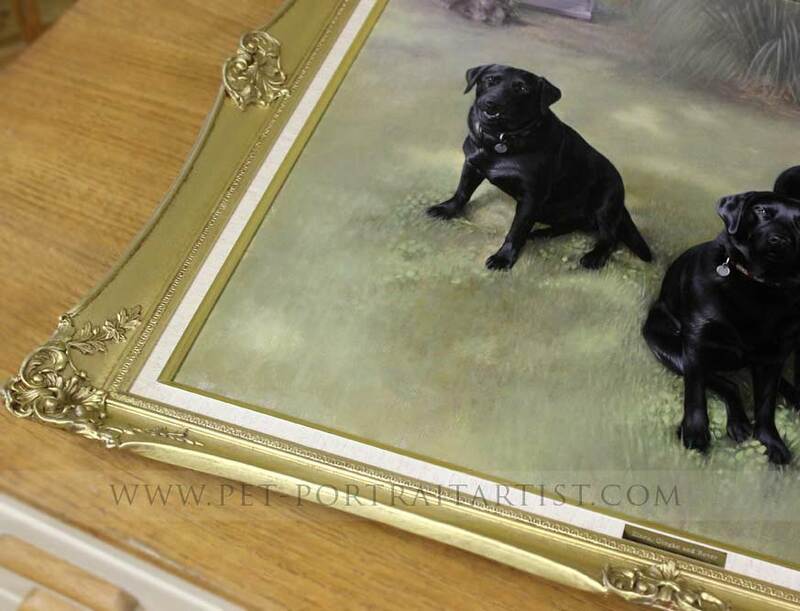 The frames can also be painted in any colour form the Farrow and Ball range. 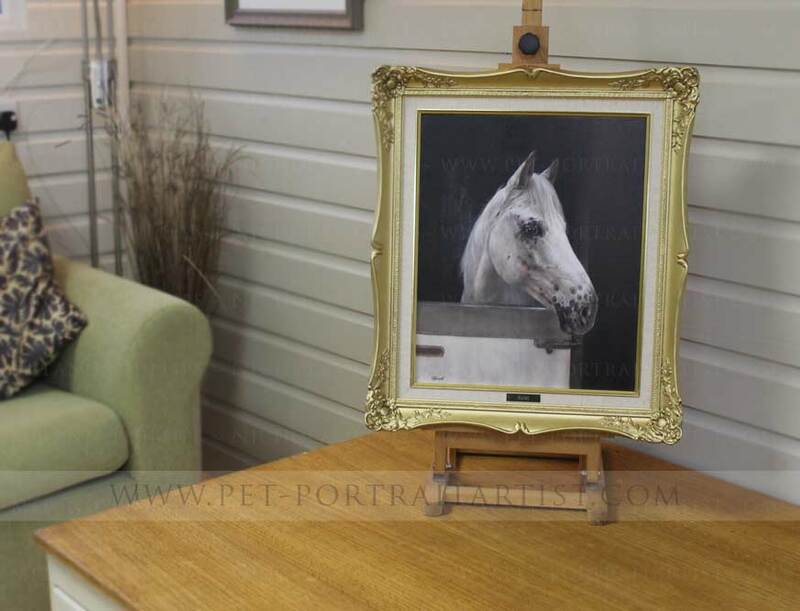 If you would like to see samples or discuss the various colours available, please do drop us a line at any time. 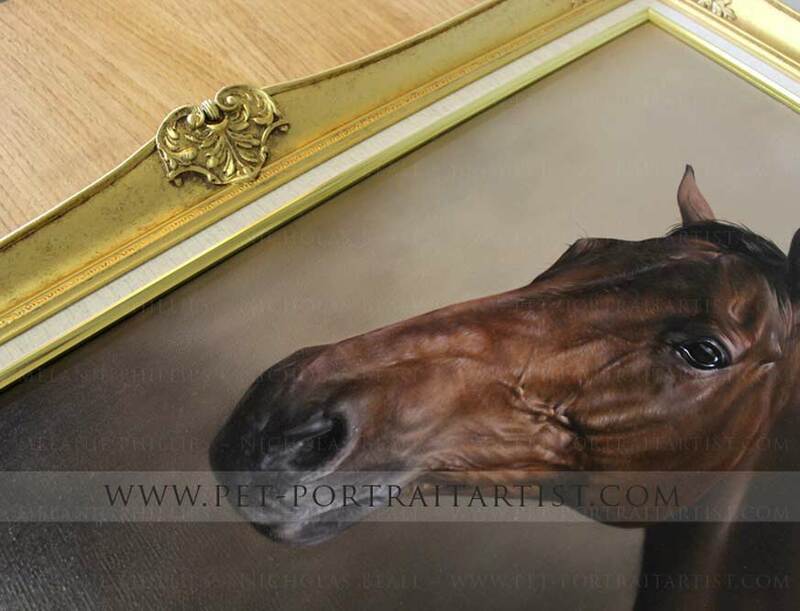 As you can see from the close up photo below, the framed areequisityly finished. 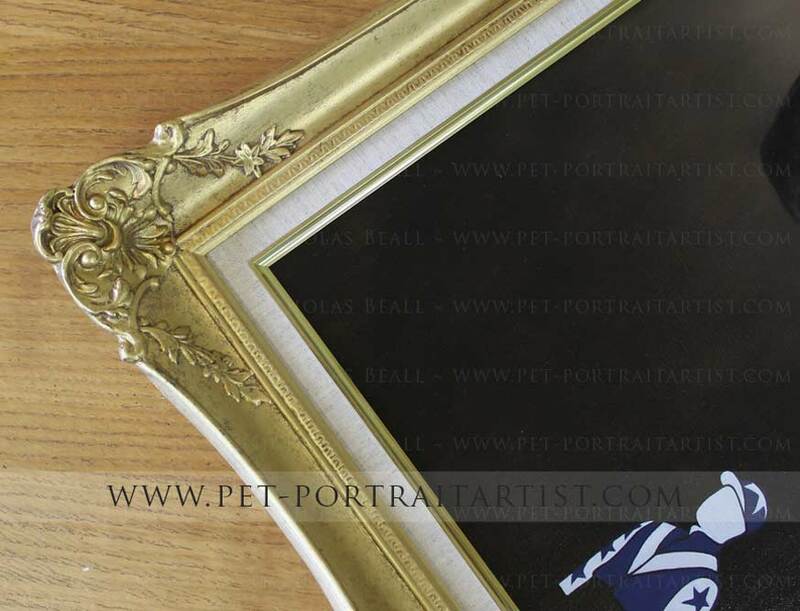 We have frame sam,ples here in the studio and even have one of these gold frames as a mirror in our own home. 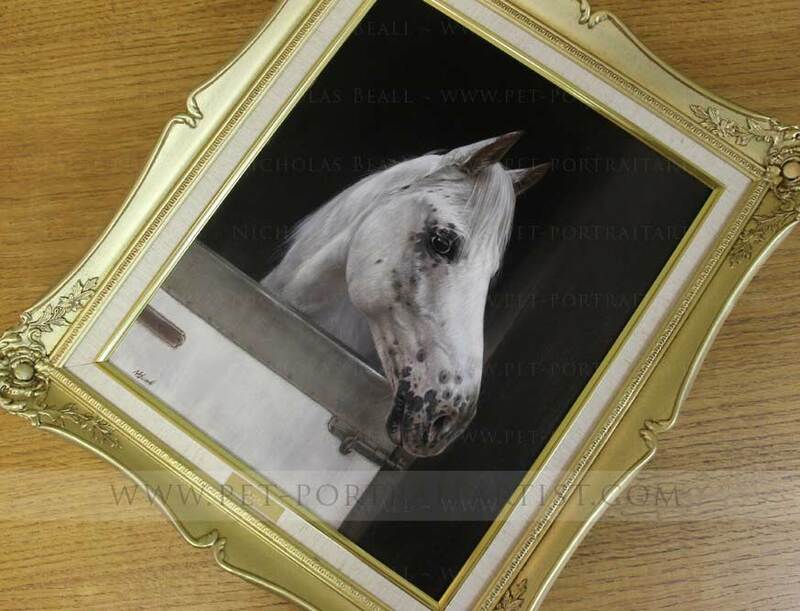 if you are intending on visiting our studio you are more than welcoem to view our samples while you are here. 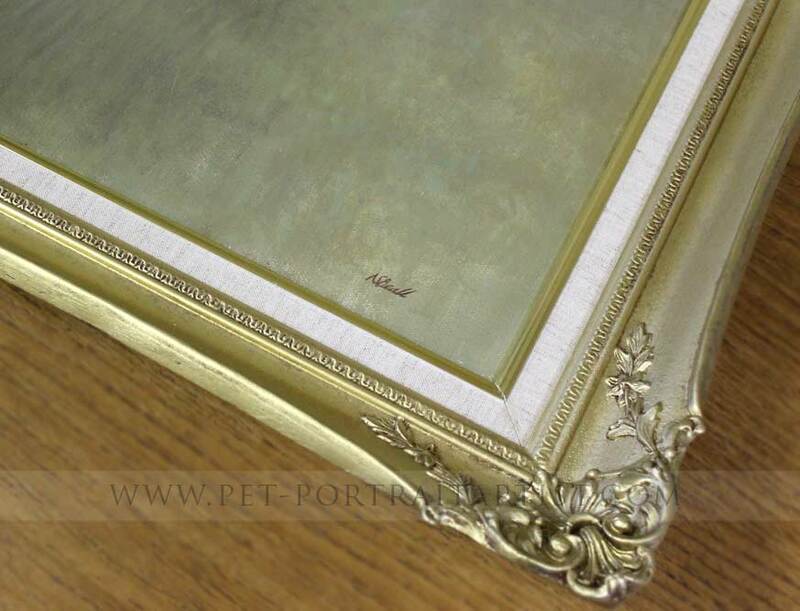 Edward and his team of professionals also offer gold and silver leaf finishes on their frames. If you ahve something specific in mind like this, you are more than welcoem to email and with your ideas and we will get a quote for you. 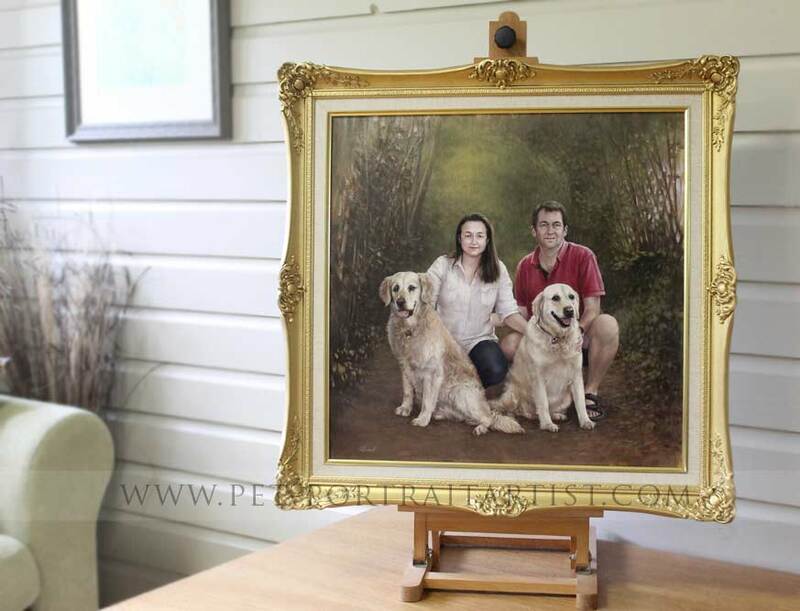 If you require any help when choosing the best frame to go with your portraits, you are more than welcome to email us at any time. 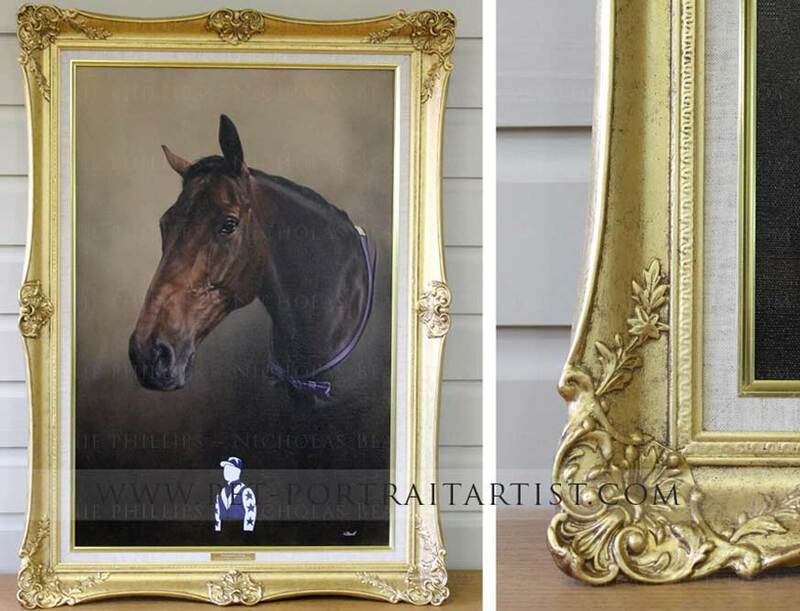 We hope you enjoy the rest of the photos of our portraits in our Knightsbridge Gold Frame gallery. 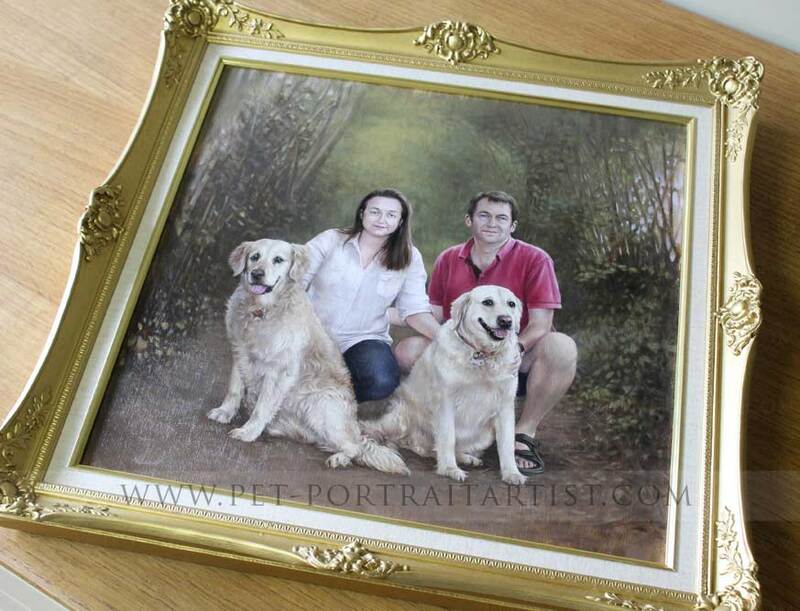 Firstly thank you very much for both for the picture of Cleo and Clemmie, they are exquisite and they have both been extremely successful. 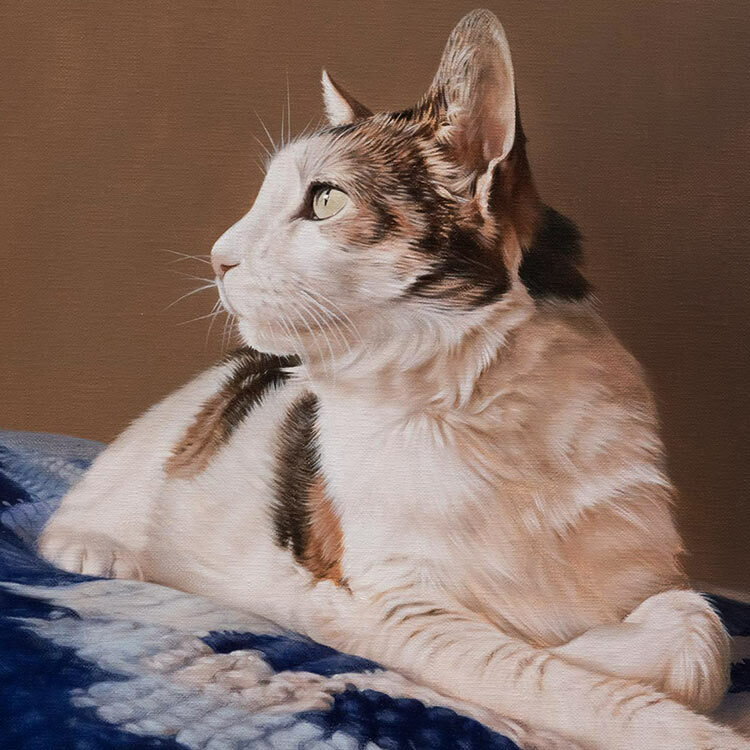 Everyone who has seen then two drawing has said how incredibly like Cleo and Clemmie they are, you have managed to capture their character in both drawings. The Clemmie one is just wonderful you have managed to do exactly what I wanted and the final looks is absolutely perfect, I cant thank you enough. Both George and my mother are over the moon with their present. 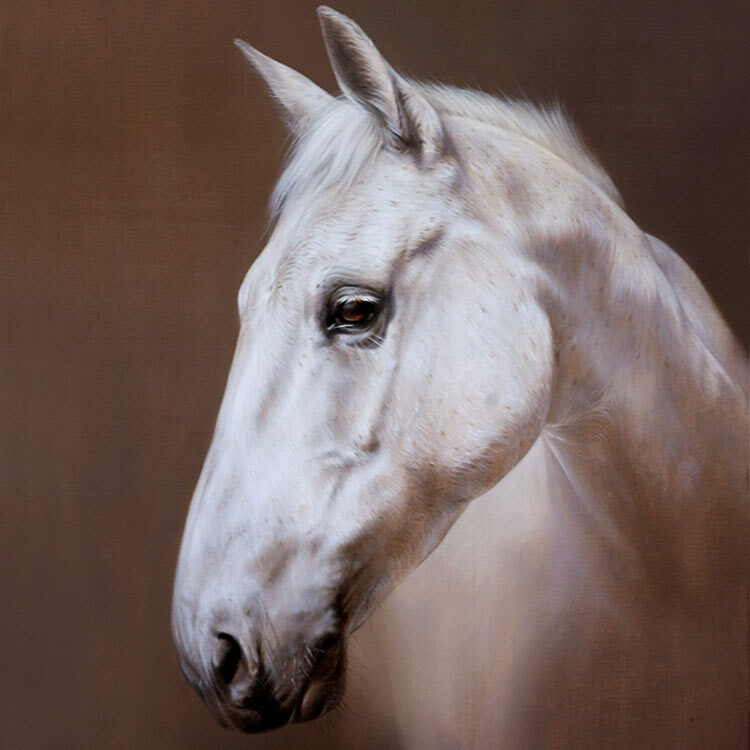 I have also passed on your detail for someone already that was so impressed with the drawing so hopefully you might get some more business. 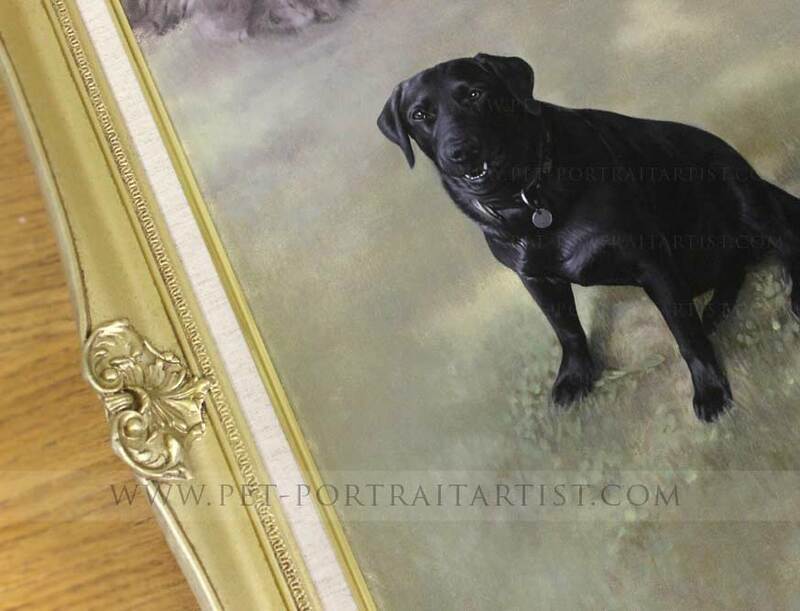 George and I will probably get in touch again sometime as our best man has a spaniel too Clemmies father, who is getting on a bit and it would be wonderful for him to have something to remember him by. I have enclosed a photo of Clemmie and us at our wedding we had a perfect day. Thank you again for them both I couldnt be happier with them they have been such a success. 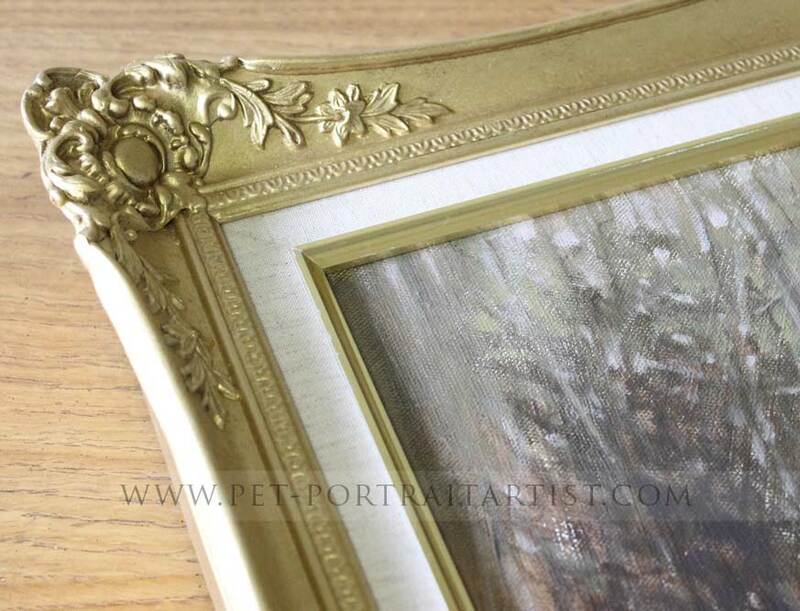 Our Traditional Flat Frame is one of our longest running frames and works for both pencil drawings and oil paintings.